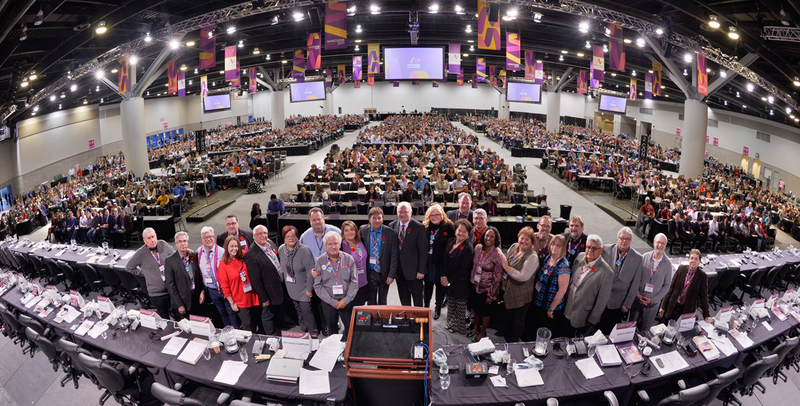 More than 2000 CUPE members came together in Vancouver from Nov. 2 to 6 for CUPE’s 27th biennial national convention. Here are 10 reasons to celebrate. Elected a new national president – Mark Hancock. He is CUPE’s sixth national president and will provide strong leadership in the coming years. Took the leap! With a rally to show our support for the leap manifesto, we called on Canada to act decisively to transition from a fossil fuel-based economy to a pollution-free economy. Passed a resolution to reorganize our defence fund so that more resources can go to funding our critical ongoing work while protecting a healthy strike fund. Paid tribute to our activists – starting with a big thank you to our outgoing national president, Paul Moist and honoured our award recipients in literacy, health and safety, communications, and equality. Launched a convention app – a first for CUPE - with more than 1,900 people accessing convention resources and communicating with fellow delegates on their mobile devices. Set an ambitious course for the next two years by adopting Strategic Directions with a focus on building workers’ power to improve our workplaces and communities, and to build a better world. Increased our knowledge and capacity by sharing our challenges and successes at forums, sector meetings, caucuses, the CUPE village, and on the floor of Convention. Built international solidarity with special guests like Lee Saunders and Rosa Pavenelli who reminded us that our issues are similar across the globe and the important role we can play across borders. Celebrated the defeat of the Harper government and highlighted the important work ahead for the NDP in holding the Liberal government to account in the upcoming Parliament. Found inspiration and insight in passionate speeches from Naomi Klein, Murray Sinclair, Lee Saunders, Rosa Pavanelli, Hassan Yussuff, Mohamed Fahmy and Tom Mulcair. For full convention coverage, including photos and videos, visit our convention page.